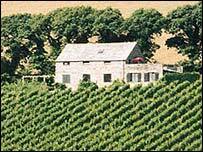 Wine producers in Cornwall say the industry in the county is continuing to expand. They say a combination of last year's excellent harvest, and early good weather all indicate this season will be particularly successful. A series of special events are being held at vineyards across Cornwall over the next few days as part of English Wine Week. The week aims to promote locally produced wine. Bob Lindo, from Camel Valley Vineyard, said Cornish wine is becoming increasingly popular. He said: "There's been a tremendous surge in interest over the last few years. "I always used to say that there's not really enough made for us ever to have a big upsurge. "But what's happened is that everyone's suddenly got interested and keen on it so we're all having to rush around and plant more vineyards." Mr Lindo, a former RAF pilot, set up the business in 1989 and his vineyards are situated on the slopes above the River Camel - halfway between the Atlantic and Channel coasts.